Columbus is a wonderful place to visit during the holidays. From millions of sparkling lights strung throughout the city to plenty of boutiques and big name shops to help fulfill your holiday shopping needs, Columbus is a must-stop spot to get in the holiday spirit. An earlier sunset during this season just means more time to enjoy the bright and colorful lights around the city! Celebrate the holidays by visiting these festivals, events and illuminated displays in Columbus. Wildlights at the Columbus Zoo and Aquarium, recently named one of the 10 most spectacular holiday light displays across America by MSN, is one of Central Ohio’s favorite family traditions. What started as a few strands of lights and trays of cookies has turned into millions of LED lights, animated musical light shows, visits from Santa, reindeer and other holiday festivities. This year&apos;s event offers more holiday fun than ever before and runs daily Nov. 17-Jan. 1, 2018. 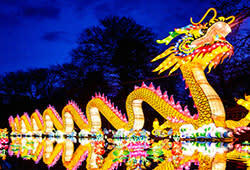 The Ohio Chinese Lantern Festival will light up the Natural Resources Park at the Ohio Expo Center with 39 larger-than-life illuminated displays crafted by Chinese artisans. This seasonal favorite, a 5-week celebration of Chinese culture features exquisite silk lanterns, traditional performances and amazing food Nov. 17-Jan. 7, 2018. 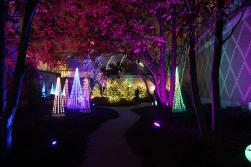 Gardens Aglow, formerly Merry and Bright, returns to Franklin Park Conservatory and Botanical Gardens Nov. 18-Jan. 3, 2018. View elegant displays of poinsettias, seasonal foliage and twinkling lights enhanced by sleek and bold mid-century modern design elements. Enjoy captivating entries in the annual gingerbread competition, a Paul Busse model garden railway and an array of family activities and special entertainment. Enjoy the Festival of Lights at Columbus Commons Nov. 23-Jan. 2. Stop by after a downtown dinner to see more than 300,000 LED lights dazzle in the park. After you’ve walked through the Commons’ holiday haven, hop across High St. to check out the displays in the Lazarus Building windows along High and Town Streets. 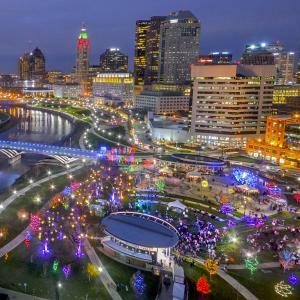 Take in the stunning view of the Scioto River and the beautiful city skyline sparkling with more than 250,000 lights. On Dec. 2, these lights illuminate the Scioto Mile beginning with the first annual WinterFest, a celebration of giving featuring local and national musical acts, seasonal ales from hometown breweries and favorite dishes from Columbus food trucks. Twinkling luminaries greet visitors who are ready to kick off the holiday on the historic, brick streets of German Village during Village Lights on Dec. 3. Enjoy the magic of the holidays and visit shops, businesses and restaurants open late with holiday treats, discounts and special offers. Festive surprises are at every corner including carolers, live holiday music and Munich-inspired Striezelmarkt complete with vendors and gluwein. One option to see multiple holiday light displays in Columbus is on the Holiday Lights Tour with Columbus City Adventures. Immerse yourself in the holiday spirit with a jaunt through Central Ohio&apos;s twinkling winter landscape along the Scioto Mile, the Columbus Commons and the beloved tradition of Christmas Corner. Or, book an overnight stay at any Columbus hotel and receive tickets to Wildlights at the Columbus Zoo and Gardens Aglow at Franklin Park Conservatory with our Holiday Lights travel package. 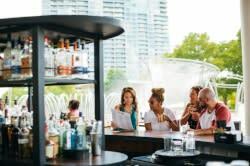 While you’re here, make sure to check some names off your holiday shopping list by stopping at any of the unique stores located throughout the city. Don’t miss Holiday Hop Dec. 2 in the Short North Arts District to celebrate art and partake in an evening of sights, sounds, food, shopping and cosmopolitan holiday fun! And then check out HolidayVille the next day, Dec. 3, from 12-4 p.m. in Clintonville. The neighborhood-wide holiday shopping event features carolers, cookies and sales at more than 25 neighborhood shops and restaurants. Free Jolly Trolley rides through the neighborhood make it easy to experience all the festivities.